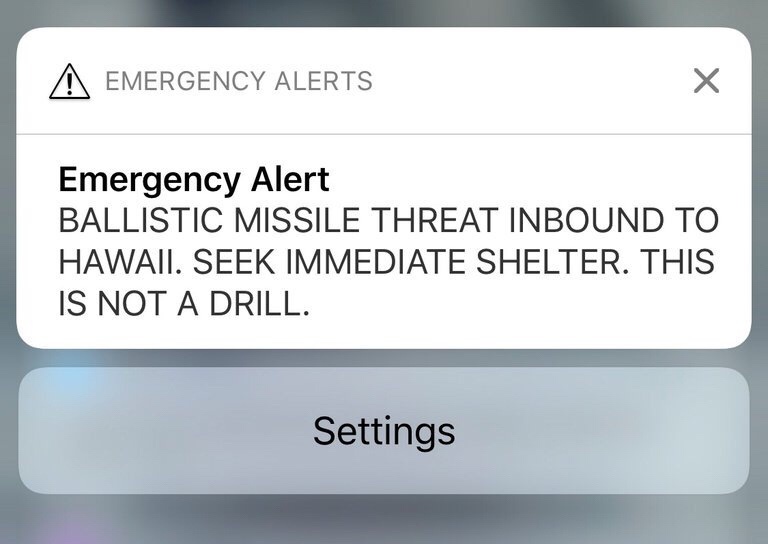 Remember back on January 13, 2018 when we heard about the panic caused by the false incoming missile alert that was issued in Hawaii? For anyone who experienced that, I’m sure it was a terrifying part of their life in an otherwise idealistic location. I hope to never have to live through something like that, real or not. Every time my phones (I have two) send an alert I jump. While they’ve all been of an advisory nature so far, it’s still scary. While my wife and I were vacationing in British Columbia this summer, we met a woman who was in Hawaii at the time of the alert and she shared an interesting story. She was vacationing with her family, and at the time of the alert she was with her 18 year old daughter and 84 year old father, so there were three generations together at the time and they all reacted quite differently. Her young daughter went into panic mode, due to the fact that she had her whole life ahead of her, and she saw that life coming to an end in less than 30 minutes time. Her mother told me that her daughter was really upset, understandably so, about the situation. The mother went into “protection mode” and tried to figure out how she could protect herself and her family from the incoming missile. Not that it would have made much of a difference, if the threat had been real. Her father didn’t react at all, and basically told her that there was nothing they could do, and just waited for the incident to play out. At 84 years of age, he had lived a good life and seen many things, and to him this was just one more action in his life. How we react to events around us is important but also based on who we are, how old we are, and what we believe in. If we believe that our time on earth is short, but our time in heaven with God is eternal, then the events of earth shouldn’t trouble us as much. This is all part of God’s plan. Now saying that is easy, but living it is more difficult. When we see or hear of terrible events, we are always saddened or shocked, and that is a normal human emotion, but if we hold on to our faith, and pray that those affected are now at peace in preparation for spending time with our God, then that should help to ease the pain inside. We need to have faith, as the 84 year old man did, that we have no control of what happens to us during our short time on earth, but we have all control as to what happens after our time is done. Life the life that God wants us to live, and we’ll spend eternity by His side. Amen to this. I find this post very inspiring. It celebrates hope and positivity, something that my life lacks, it somehow makes me feel a little bit better. Thank you for this. I try to live life in a positive manner. I spent too many years being negative and finding the bad in life. I now find that my worst days today are better than my best days before. God gets me through anything as long as I trust Him. God bless.